Updated Friday January 17, 2014 by Whitby Minor Baseball Association. On Saturday December 14th our team, the Rookie AA's, had our team baseball Christmas party. Instead of a gift exchange, we decided on giving back to our community instead. 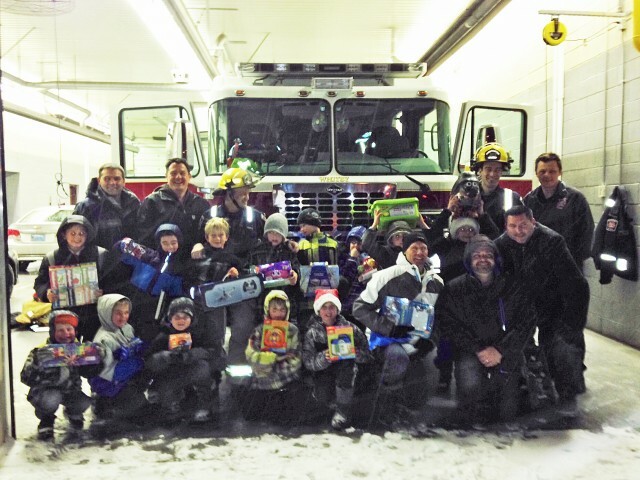 We surprised Whitby Firehall Station Number One who are accepting toys for their annual toy drive, by knocking on their locked doors at 8:00 pm. The Firemen were so appreciative that we came by, that a few suited up and others quickly put together some thank you gifts for the boys. We are very proud of this group of 8 year olds for bundling up and walking the toys over on a perfect snowy night. Go Whitby Chiefs!